Save the date! 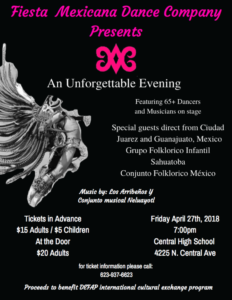 Fiesta Mexicana Dance Company is collaborating with Dancers and Musicians in a night to remember. Live music, 65+ dancers and musicians. It is something you will not want to miss. Feel free to contact us if you have any questions. Hope to see you there.